The Royal Horticultural Society (RHS) is warning gardeners to be careful about sharing fuchsia plants and cuttings. The warning has been issued to help stop the spread of the fuchsia gall mite, Aculops fuchsiae. The mite was first detected in the UK by the RHS only three years ago when one of its members in Hampshire sent a sample of severely distorted growth on a fuchsia to the RHS members’ advisory service for diagnosis. Since then other samples of mite-infested fuchsias have been sent in every year and the mite is known to be widely distributed in Southern England from Kent to Devon. “This is a devastating pest because it destroys the plant’s shoot tips and flowers. None of the pesticides available to gardeners will control it,” says Andrew Halstead, RHS Principal Entomologist. This is a devastating pest because it destroys the plant’s shoot tips and flowers. “Although the detection of fuchsia gall mite has to be notified to the Plant Health and Seeds Inspectorate at FERA (Food and Environment Research Agency) they are not taking any action on plants in private gardens. There is little that gardeners can do about this pest except destroy infested plants to prevent the mites spreading to other fuchsias. Late summer and autumn are good times to look for infested plants as gall mite damage should be obvious by then if the pest is present. In spring, vigorous new growth may mask the presence of the mites, particularly as they are likely to be present in lower numbers at that time of year. The mite is microscopic and so is easily spread by the wind. It is also likely that bees visiting flowers on infested plants will pick up and transfer mites in a similar manner to pollen grains. So if one plant has become infested it is likely that other fuchsias in the garden may be as well. Symptoms of infestation develop gradually. Usually a reddening of the leaves is first noticed, especially at the shoot tips. As the mite numbers increase leaves, flowers and the shoot tips become deformed and swollen. Finally all new growth stops developing. Normally the RHS only provides its free diagnostic service to its members. However, because of the charity’s concern about the spread of this relatively new pest and the damage it does it has opened the service to non members who believe they might have an infested fuchsia plant. Gardeners, therefore, who suspect they may have fuchsia gall mite can send or bring samples of affected shoots in sealed polythene bags to Gardening Advice, RHS Garden, Wisley, Woking, Surrey, GU23 6QB. Digital images of damaged plants can also be sent to gardeningadvice@rhs.org.uk. The charity advises that fuchsia leaves that are misshapen with many small holes, but are green and of normal thickness, have been damaged by capsid bugs. 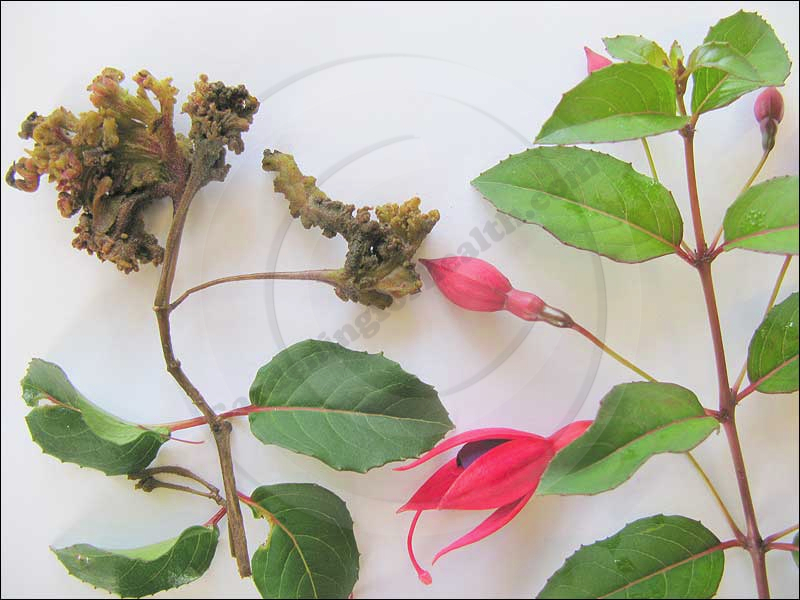 Fuchsia gall mite causes thickening and severe distortion of the foliage, which may be reddish pink or yellowish brown. “Fuchsias are popular garden plants because of their long flowering period in mid – late summer,” says Andrew. “As this pest becomes more widespread I anticipate that their popularity will go into sharp decline. Apart from losing the showy colours they add to our gardens we may also lose the spectacular hedgerows of fuchsias in Cornwall and Devon. 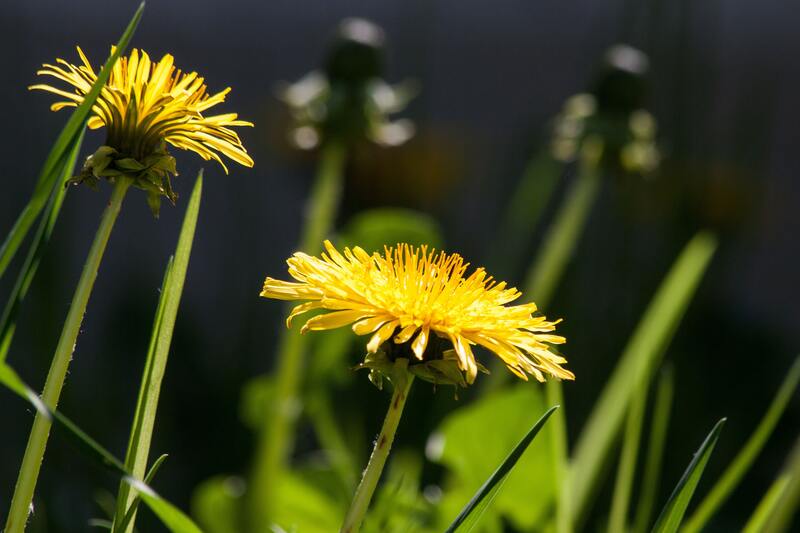 The RHS recommends that any plants showing symptoms of infestation should be dug up and burnt or buried, as there are currently no other effective control measures available for use in gardens. Neighbours should be encouraged to do the same. The charity also suggests leaving a gap of a year before trying to grow replacement fuchsias. Fuchsias in garden centres and any cuttings or plants offered by friends should be checked carefully and rejected if there are any signs of distorted growth.